Intelligent, cunning, wary, and stealthy, varmint animals are some of the most challenging prey to shoot down when hunting. To hunt these predators successfully, you’ll need to step up your hunting skills. One way of doing that is getting the best varmint scope. The type of scope you use during varmint hunting can make the difference between missing a clear short-range shot and making an impossible shot from a long distance off. So, to ensure you are armed with the best varmint scope, here are the three most crucial scope qualities you should look for. Magnification level is by far the most important factor to consider when looking for a scope for varmint hunting. Varmints are cautious and sly in nature. As such, these animals are always on their guard. Getting close without arousing them to your presence is very difficult and therefore, the only option you’re left with is hunting from a distance. To do this well, you’ll need a scope with a high level of magnification. The appropriate level of magnification helps to make aiming at targets easier and also increases your chances of making opportunistic shots from a distance. Remember that high magnification on a scope is not always the best. In fact, high power scopes will limit your field of view when focusing on a target at the highest level of magnification. To avoid over-scoping your rifle, ensure to choose the preferred level of magnification while taking into account distances you intend to be shooting from. Flexibility is also an important quality to look for in a varmint scope as it enables you to adjust scope’s magnification to your specific distance range. Generally, the best magnification range for varmint hunting would be 3-12X. The most opportune time to hunt varmint is during low light conditions such as dusk or dawn. Low light impairs a varmint’s defenses and reflexes thus rendering it vulnerable and easier to hunt. Unfortunately, dark conditions also impair our sight, making it difficult for us to see as clearly as we would during daytime. This then necessitates the need for a riflescope with a good amount of light transmission. 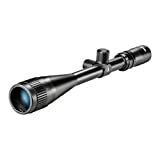 Multi-coated riflescopes come with a wide range of light transmission with some offering as high as 98% light transmission. Anything above 95% is considered great for varmint hunting. An illuminated reticle is also a bonus feature to have when hunting varmint in low light conditions. When you adjust the magnification on a scope, you also alter the exit pupil’s size, which regulates the amount of light passing through the scope to your eye. Generally, when magnification is increased, the exit pupil decreases. This makes it difficult for you to get a clear picture of your target especially when hunting under low light. Therefore, it’s imperative that you go for a quality lens with an exit pupil diameter that adjusts to the surrounding. Normally, the human eye dilates to a diameter of 5mm in low light. Ideally, the exit pupil of the scope should exceed the dilation of the eye for your eye to receive as much light as possible. A 50 mm (or higher) objective riflescope will make a nice fit. Such objective lenses have a wide enough range to ensure ideal exit pupil in a variety of magnification settings. Thick lens coating is also a good feature to go for as it improves your scope’s light gathering capabilities and improves target picture in low light conditions. On the subject of lenses, you should pay close attention to type of reticle and available field of view provided by a scope’s lens. The wider the field of view, the better it is as varmint hunting usually involves shooting at rapidly moving targets. As for the reticle, finer variations provide the fine aiming point needed for longer ranges. So, to recap, a good varmint riflescope should be able to zoom in on targets from a variety of distances, prevent light glare, provide a wide field of view, and adjust to poor lighting. Having these qualities in your scope will help even out the odds when it comes to varmint hunting.